There is a reason why Aida's Secrets is plural. Even after her death, the story of Aida Zazasinka and her sons is still a tangle of mystery and confusion. It makes one wonder not just about whether our parents have a right to keep things to themselves, but also whether what people want to take to the grave should remain there. However, Aida's Secrets, which might have been shameful then, also robbed others of family and may not be a scandal now. It's a strange thing, keeping secrets. Alon Schwartz, the writer/director/producer of Aida's Secrets, knew a secret of his own, something kept from his uncle Izak in Israel all these nearly sixty years. Izak knew his mother Aida sent him to then-Palestine when he was a baby after the Second World War, while for reasons unknown she went to Canada after leaving Bergen-Belsen Displaced Persons Camp. At long last, Izak is told the truth, the first of many secrets: Izak has a younger brother. Whether the fact that his brother was blind was the reason for this being kept a secret we do not know, but after some searching Izak learns that his younger brother is alive in Canada. An overwhelmed Izak flies from Israel to Winnipeg to be reunited with his little brother, Shepsel, better known as Shep. Shep has made a life for himself in Canada and his blindness has not been a hindrance. He is happy to meet his long-lost brother, and in a strange turn he lived with their father Grzegorz, or Grisha, or Gregory. Part of the difficulty of locating family was that many names and spellings were used for one individual. Gregory was no saint to Shep, but he isn't going to tell Izak that. Shep learned as a teen that the woman he thought was his mother was actually his stepmother, but now also learns that his actual mother, whom Izak kept in contact with, was not only alive but a few hours from his home. Shep never knew how close he was geographically with Aida, also known as Jadwiga or Jadza. A reunion is arranged at Aida's nursing home, and Aida seems genuinely moved to see both her sons at last. However, the story is not over yet. The tangled nature of life now makes them try to find out the truth about just how close Izak and Shep are biologically. It comes from a statement someone made, that Grisha 'could' be Shepsel's father. Now things become more complex and convoluted. Alon and Shep now start digging into archives and DNA tests and asking ever-so-gently Aida questions to find out the real story. Aida may be a Polish Christian and not a Jew herself, at least that was the reason why her application to move to Israel was rejected and she had to immigrate to Canada instead. This despite having sent Izak to Israel, which was her wish for him to be brought up in the Jewish faith with a Jewish education. Moreover, life at Bergen-Belsen Displaced Persons Camp was rather active socially. Grisha was a major Don Juan, having married Aida, then had a South African kindergarten teacher named Tippi as a mistress, then having a fling with a secretary, before marrying a German widow named Margaret, who was Shep's stepmother. It's all very convoluted. We find that DNA shows that Izak and Shep are only half-brothers, sharing the same mother but not the same father. Of Shep's parentage there isn't doubt: it's Aida and Grisha. Of Izak's parentage, now there is room for doubt. A man in a photo of Aida's collection, taken at the same time as the only one of the whole family, which we have seen before in Aida's Secrets, may be Izak's father. However, is Izak's father actually German? As if all this is not already quite a muddle, we get near the end a third twist: researchers have found a third brother born in 1949! Shep, ever so gently, makes inquiries of to his elderly mother, but she insists softly but firmly that she does not remember anything. Whatever she knew of this she literally takes to the grave. A post-script tells us that shortly after Aida died, the third brother was located in Toronto, but he opted not to meet with Shep and/or Izak. 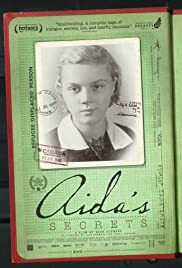 Aida's Secrets is a fascinating story filled with interesting people in their complexities. There are some particularly touching moments that will really touch you emotionally. At the midpoint of Aida's Secrets, after being reunited with Shep, she sings You Are My Sunshine to her second-born, and it shows that whatever flaws or mysteries there were, a mother and child reunion is among the world's most beautiful things. We also get unexpected turns. Once Shep and Aida are brought together, we wonder why the film would continue. At this point, most stories end, with Izak tearfully joyful to have found his brother and united with their mother. However, as we dive deeper, we see the story go out into unexpected places, trying to untangle this situation. As we learn about the history of the post-war chaos and life in the DP camps, we find that the adults, for reasons they thought good, kept things from the children. The rightness or wrongness of their decisions are simply not known, or perhaps logical to us now. There was something that drove them then and drove them until their dying days. It seems a wild stretch to say you cannot remember having given birth to three children unless you suffered from dementia. You sense that Aida may not have wanted to talk about these things, but you also sense there was no anger or dismissal of it either. It's a strange and complicated world we see. The tangles of family secrets, from why Izak was not told for sixty years that he had a brother, to Aida's final secret revealed of a third brother, are all things that we cannot fully understand or figure out. Perhaps because some things will perhaps now never be known, we leave Aida's Secrets with the knowledge that we will always have some questions unanswered. Was Aida really a Polish Christian and not a Jew? Who was Izak's real father? Ultimately, does it matter? Izak is happy to have found his 'little brother', and Shep too now has someone new in his life, and has made peace with his mother. I think that matters most of all. Family is a strange thing, even for those who know the connecting ties between oneself and those related to us. Aida's Secrets perhaps should not have been, but at least some of the mystery and shame is gone.